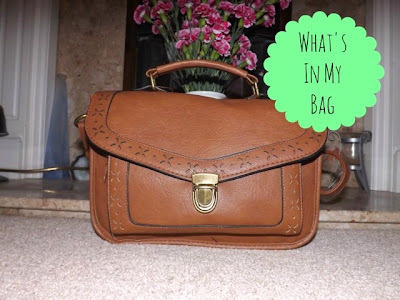 YOURS CHLOE: What's In My Bag? Today I'm writing a post that has been requested a fair few times during the time I've been writing my little blog. 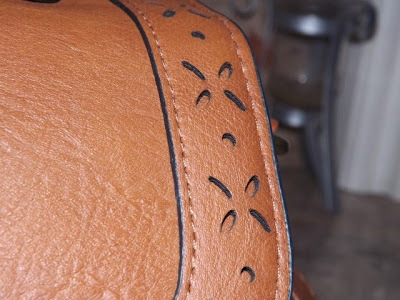 You probably already know what I'm on about, having read the title of the post, but it's a What's In My Bag post. I love a good old what's in my bag post, as I just love getting to have a peek at all the things someone else carries around with them everyday. I think the contents of a handbag can tell you a lot about the person and that's always lovely, especially in the world of blogging. So, if like me, you are quite a nosey person, this post is likely to be one that is right up your street. 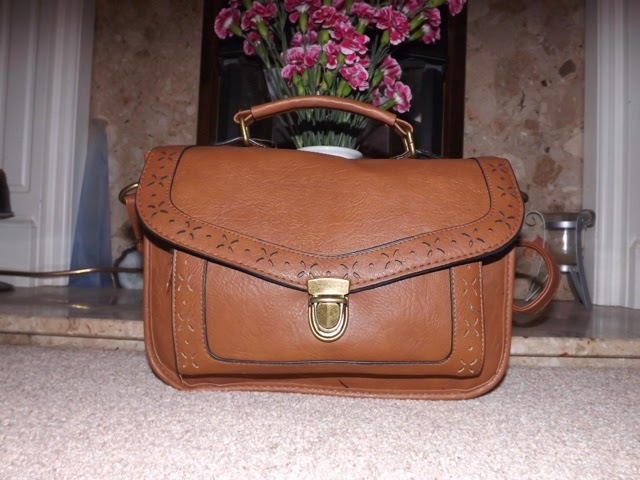 My little bag is one I purchased from Primark about three or so weeks ago now, for the amazing price of £8, I do believe. 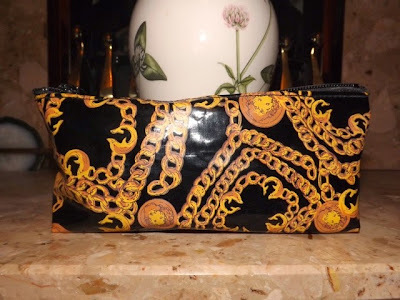 It's a tad on the small side for a handbag, but as I tend to carry what seems like the whole world, around in my bag, I thought this time I'd buy a bag that's on a smaller scale, so I have no choice but to only carry around the essentials. It's your typical satchel shade of brown, but it has this stunning cut-out floral details around the edges of the front of the bag, which makes it look very pretty. 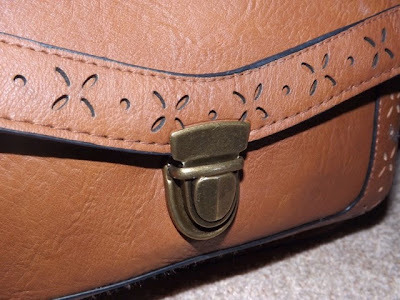 As with all satchels, it has the flap top opening and a grab handle, along with an adjustable shoulder strap. The first item in my bag is my purse. Now, I picked this up from Primark around a year ago. I can't at all remember how much it was but I can't see it being more than £5 or £6, seeing as it is Primark. Inside the purse, it has your usual zipped coin pocket, with space either side for notes, reciepts or whatever takes your fancy. 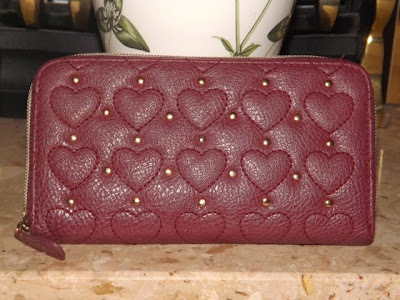 It also has lots and lots of inner card compartments, which is fab as I have more loyalty cards for different stores, than I probably need, and I need a place to store them all. Next in my bag I have my iPad mini. Myself and my iPad are inseperable so it's so handy it fits in my bag as it means I don't have to look like a muppet carrying it around all the time. 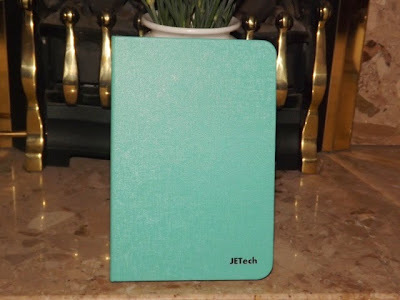 I keep it in a mint green case I purchased from Amazon (you can find it here). If you are interested in seeing which apps I have on my iPad, I did a "What's On My iPad?" post a few months back, which you can find here. 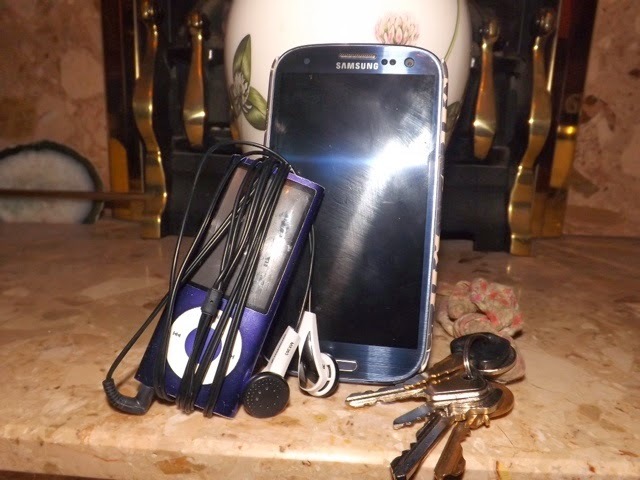 Now it's the turn of my Phone, iPod Nano and Keys. There isn't much I can really say about this apart from the fact that my Phone is a Samsung Galaxy S3, which I keep in a case I picked up in the Next Boxing Day Sales for around £3. My iPod is a purple iPod Nano 4th or 5th generation, I can't remember which because I've had it for forever and a day. Finally, I keep my keys attached to an old Topshop wire bow bracelet. It was one I never actually wore and it's really handy having them attached to something fairly large that I can grab easily. 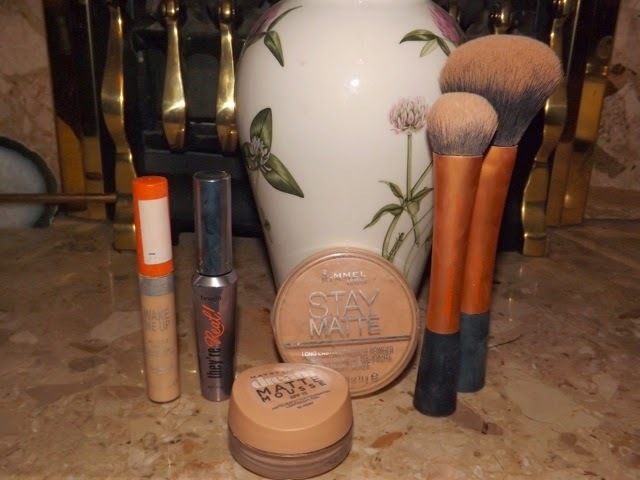 In one of the internal pockets of my bag, I keep some of my most used makeup bits and pieces, so they're easy to find. 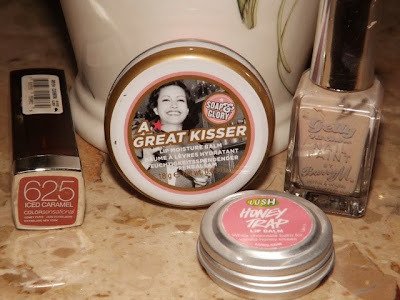 At the moment, it contains my Maybelline Colour Sensational Lipstick in the shade "Iced Caramel", my Soap and Glory 'A Great Kisser' Lipbalm, my Lush "Honey Trap" lipbalm and my Barry M "Lychee" nail polish. I'm one of those girls who always carries around the nail polish I'm wearing, because I simply can't stand having chipped nails so I always have to have the polish on standby ready for me to touch up my nail the second they chip. Is anyone else like that? 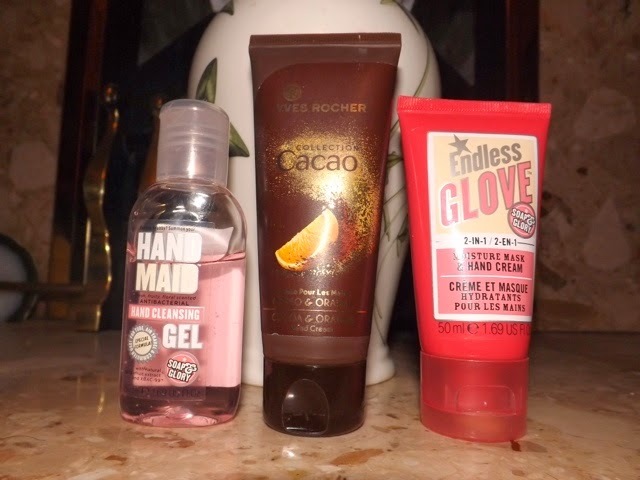 These are three of my go-to hand products, so I always keep them lying about in my bag. Hand Cream-wise I have the little Soap and Glory "Endless Glove" Hand Cream and the Yves Rocher Hand Cream in "Cocoa and Orange", and I also use my Soap and Glory "Hand Maid" Hand Sanitiser when my hands are feeling a bit grubby. I can't be the only girl who carries food around in her bag, can I? It's always nice to pop a snack in your bag before you go out, just incase you get peckish when you're on your travels. 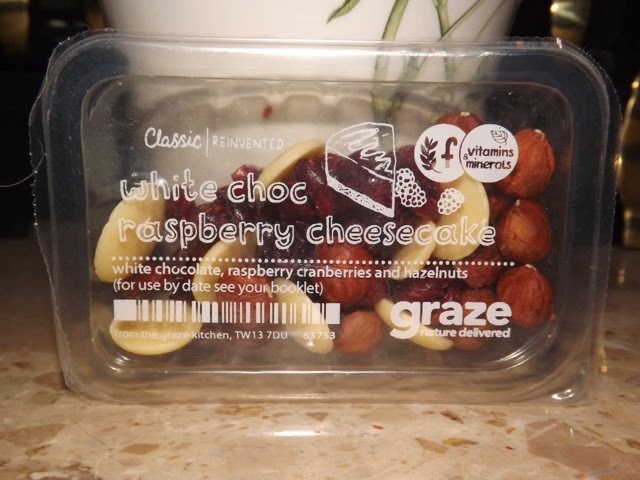 My snack of choice at the moment is the "White Choc Raspberry Cheesecake" selection from my Graze Box. It contains a lovely blend of white chocolate, raspberry cranberries (they're nicer than they sound - trust me) and hazelnuts. Yummy. This is always a necessity. 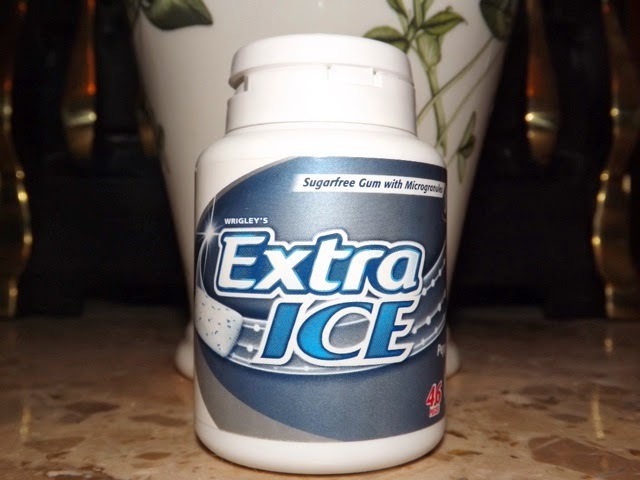 I spend most of the time I'm up and about during the day, chewing gum so I have to have a well-stocked supply handy at all times. You can pick these fabulous pots up at most supermarkets and they're actually really good value for money considering how many you get per box, compared with the cost of buying multiple individual packets. The only issue with these pots is, when you're walking they sometimes rattle, which is so annoying so I always try to bury the pot at the bottom of my bag to it making too much noise. 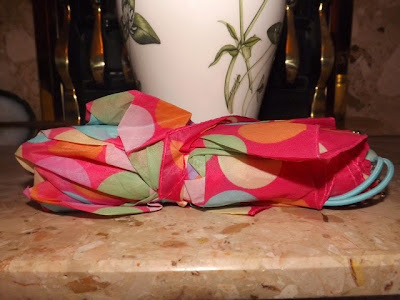 This is England, and you never know when you're going to need an umbrella, so I always keep mine in my bag ready to protect me from any nasty rain showers. 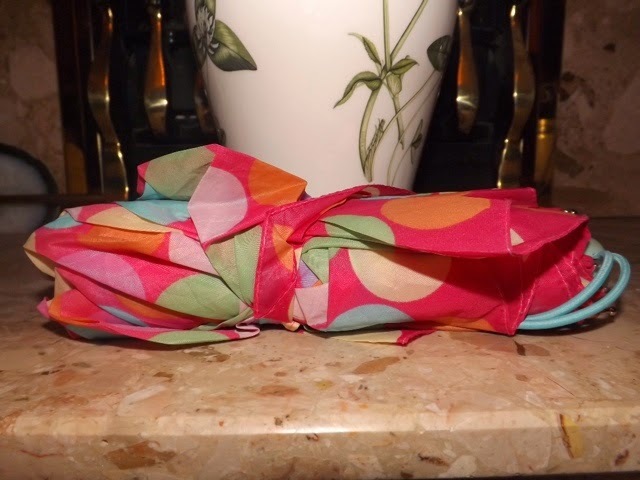 I think I brought this umbrella from Primark a while back and it's served me well so far. 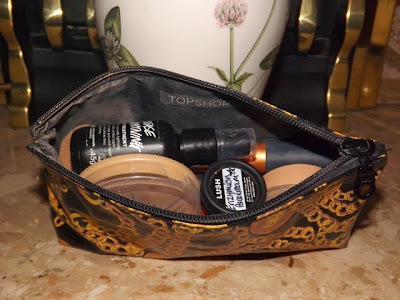 Next in my Bag is my Topshop Makeup bag, filled with some of my daily makeup. I always get very paranoid about the state of my makeup so I like to carry a little bit around with me so I can top it up as and when it requires it. I picked the bag up from ebay a few months back and it's perfect handbag size, so I'd recommend popping over to Topshop if you need a travel-sized makeup bag. It wouldn't be a post on this blog without some reference to Lush now would it? 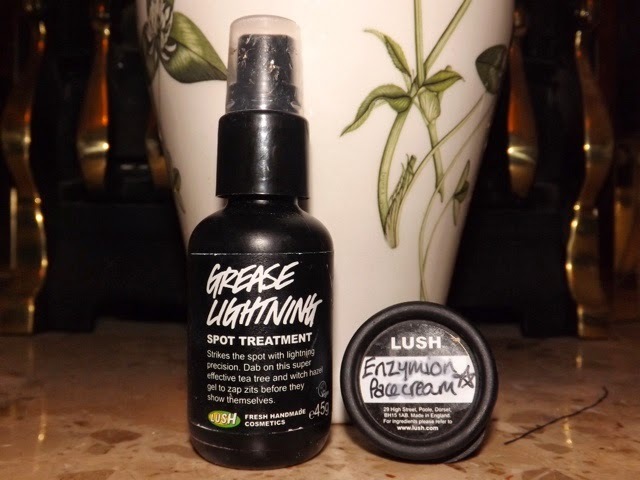 I keep two Lush products I keep in my bag, starting with"Grease Lightning", which is what I consider to be the worlds best spot treatment. If I ever notice a pesky spot about to make an appearance, I just dab a bit of this on and it works like magic. The other Lush product I have in my bag, is (ignore the label) their "Dream Cream" hand and body lotion. Lush sell this product in huge great pots so what I tend to do is grab a teaspoon and pop a bit of it into an old Lush sample pot, so it's perfect handbag size. You could probably do this with any hand/body lotion that isn't sold in handbag friendly sized pots, so give it a try. I also have my little Primark mirror, with a stunning floral pattern. 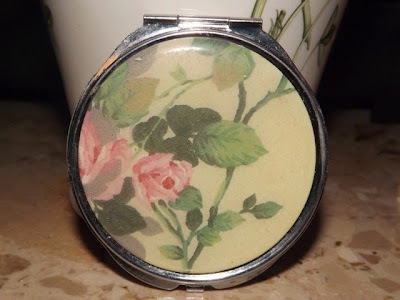 This was a bargain at around £1.50 and it's the perfect size for a mirror: big enough for it to be practical, yet small enough for it to fit in my makeup bag for when I'm on the go - win win. Also in my makeup bag, you'll find my slanted tweezers by the Vintage Cosmetics Company. 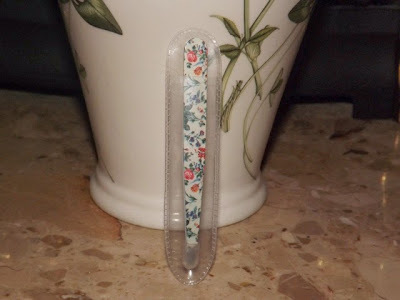 I don't think I've mentioned them on my blog before but they are my most favourite tweezers in the whole wide world. They're so good at getting all the little hairs and they're so easy to use, so it's so much easier to be precise when plucking your eyebrows. I didn't photograph them but I also keep a little notebook and a couple of pens in my bag for noting down different blog post ideas as and when they pop into my head. This is a necessity for any blogger though, isn't it? So those are all the bits and pieces I have in my bag! If any of you have written posts like this, leave me a comment so I can have a read. 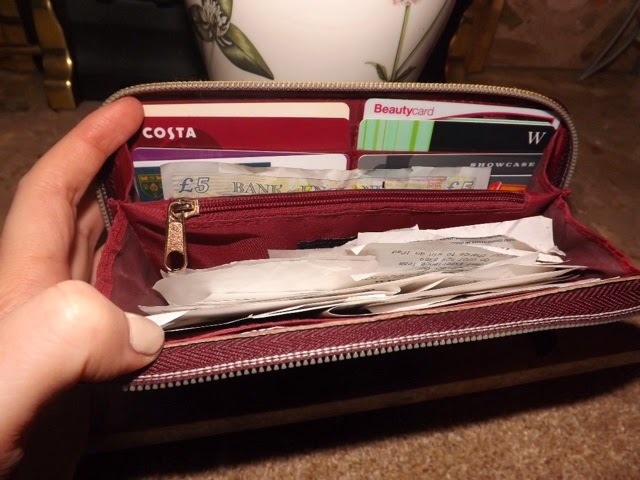 What do you keep in your handbag?